Best model of devolution and decentralization, both political and executive power to the periphery and the people. This is how Mahavamsa narrates the demarcation of village boundaries by Pandukabhaya in 427 BC. Lakadeepamhi sakale – Lankindo Pandukabhayo’ (MV.X.103). (King Pandukabhaya attained the throne in 437 BC). (This demarcation of village boundaries were later incorporated in to the Tun-Sinhale map which continued until 1815 with minor boundary changes, the last being the Udarata Rajadhaniya (Kandyan Kingdom) with its capital in Senkadagala Pura (Mahanuwara-Kandy) extending up to the sea right round the Island with access to the sea excepting a narrow coastal belts occupied by the Portuguese, Dutch and British successively, more particularly in the South Western littorals. It is in this backdrop the following proposal is made with the best of intentions with a view to rescuing the country from the present tragic situation by bringing all communities together as one nation. 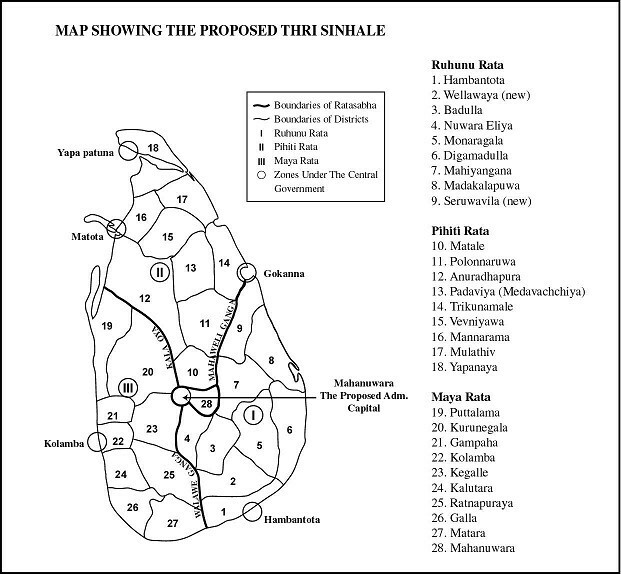 In order to achieve this noble goal, it is suggested that we go back to the re-establishment of the ancient Thri-Sinhale with boundaries as shown in this map. This division will ensure equitable distribution of resources, both physical and human, among the three units (land, water, coast line and even people), restore ethnic reconciliation and firmly establish a permanent geopolitical framework that will, once and for all, put an end to the present political and ethnic crisis and lay the foundation for re-building a strong and vibrant nation state. Above all it will enable us to get rid of the curse of the British Provincial System imposed on us in 1833 along with the Huniyama that is Palalth Sabha thrust on us by force by India in 1987. This I am confident will provide the golden key to National, Regional, Divisional and Village level god governance and all round development in this country. The following map shows the proposed Tun Rata Divisions, 27 Districts and the Capital District. The 3 Rata Sabhas shall be re-established accordingly. I have used Mahaweli, Walawe and Deduru Oya as their boundaries. But boundary changes could be altered after factors like population; area and ethnicity are carefully studied in detail before we finally decide on the boundaries to avoid future ethnic segregation. The need to not to disturb the overall historic ethnic composition, needed to avoid communal segregation, as a safeguard to territorial integrity etc to be born in mind, when demarcating these boundaries has to be stressed. The boundaries of the proposed geopolitical division will extend from top to the sea coast. These three Rata Sabhas, the Disa Sbbhas and the Pradesiya Sabhas will be the main arms of the government in the Regions in implementing Government policies and Programmes in the periphery. Each Rata Sabha will be divided in to nine Districts totaling to twenty seven (27) for the whole country. The 28th District where the Capital will be located shall be named as a special District (Capital District- This could be either Mahanuwara or Anuradhapura) with special arrangements to represent it in the Jatika Rajya Sabha and the Uttara Mantrana Sabha. Within this geopolitical demarcation one has to give up all divisive dreams like Tamil or Muslim autonomy. Everybody has to think in terms of one nation and one country. Each Rata Sabha area will also send 28 elected Members to the Senate, at one for each Disava? Each District Council will nominate fifteen 15 names at 3 per electorate names of outstanding persons from among whom the voters will elect five to represent them in the Rajaya Sabha and five to the Rata Sabbha. The five members who come first will go to the Rajya Sabha and those who come second will go to the Rata Sabha. All these Members should he permanent residents at least for 5 years within that electorate for which his/her name is proposed and their term of office is 5 years. The members of the Rata Sabha at their first meeting will elect the Chairmen and Deputy of the Rata Sabha and also the Chairmen and Deputies of the 15 Committees. The Chairmen and Deputies of Committees in turn elect the Chief Minister and the Chairman of each Committee will be designated as a Minister of the Rata Sabha. The Chief Minister will be appointed by the President on the recommendation of the Governor in consultation with the religious dignitaries of the Rata area. The other Ministers will be appointed by the Governor in consultation with the Chief Minister and religious dignitaries of the Rata. There will be a Council of Ministers consisting 15 members presided over by a Chief Minister who will again be appointed by the President in consultation with the Prime Minister who will make his recommendations after consulting the MPP of Jatika Rajya Sabha representing the particular Rata Sabha area and Rata Sabha Members of the relevant Rata Sabha and the Religious Dignitaries of the area. Other than the President of the Republic all other elected Members (electorate) and Governors (Rata) should be permanent residents of the electorate or the Rata Sabha for which he/she seeks election or appointment to qualify to be elected or appointed to such posts. No person from an outside area shall be appointed or nomination given. Any Citizen resident in any part of the country could be nominated for the post of President provided he/she has the necessary qualifications stipulated in the Constitution. The Governor should be eligible for reappointment on the recommendation of the new Council of Ministers of the Rata Sabha in consultation with the Members of the Rata Sabha and religious dignitaries of the area. Constitutional provisions shall be made to provide for the recall of any elected member in case of his or her failure to fulfill the task assigned to him/her as a representative of the Public. The 3 Rata Sabhas (Ruhunu, Pihiti and Maya) under this system will have 3 Governors and 3 Chief Ministers and 151 Ratasabha Members (including the CM), instead of 9 Governors, 9 Chief Ministers, and 638 odd parasitic and rogue Provincial Councilors? This will save more than Rs 600 Billion annually wasted now just to upkeep Provincial Councilors, their kith and kin and this monstrous and wasteful system for no benefit absolutely to the country and that takes the country and the nation down the Gadarene slope for total disaster and bankruptcy. All development work at each level will be done jointly by the respective Councils and Government Departments. But intra-Divisional and Intra District and Intra-Rata Sabha project will be handled by the central Government. But no local work should be done by outsiders without the concurrence of the respective Councils. The central Government in this case will only facilitate the work with funds, technical knowhow etc. This will ensure much desired self- rule for the local people. All regional development within the villages, Upa Disa. Disa and Rata, other than major intra rata or intra Disa and Intra Upa Disa should be given to the people of those respective areas. All elected people other than the President of the Janarajaya should have permanent residence within the electorate which they represent. However, the nominees for the post of President could be from anywhere in the Island. No politician or public servant, either directly or indirectly shall be allowed to engage in contracts with the Government at any level. The Provinces, Provincial Councils, and the existing Pradesiya Sabha will be abolished under this system immediately. The proposed Tun Rata Model will benefit the country in the following manner. 1 Remove the Provinces introduced by the British in 1833 to divide and rule this Island and also the Indian imposed Provincial Council System and the 13th Amendment embraced by JR firstly to the North and East for his survival and rest of the country for dirty political maneuvering when no one asked for it in these regions. 2 Firmly establish a sound, strong and sustainable geopolitical framework that will consolidate the political map of the Island that conforms to geographical, regional, and cultural differences and lays the foundation for re-building a strong and vibrant nation state. 3 Provide a framework for maximum decentralization to ensure balanced and contented development in the regions. 4 Stop ethnic segregation and polarization and promote ethnic and regional harmony and reconciliation that leads to national integration. It will also put an end to all agitations for separate and independent Tamil and Muslim political entities and induce them to think and behave as full citizens of this country without having allegiance to India, Arab world or in the alternative leave for any Land of Promise. 6 Drastically cut down the Government expenditure and make available more funds for national development that will improve the standards of living of the common people. 7 Put an end to colonial administrative and political legacies that nurtured ethnic polarization and colonial servility, their divide and rule policy that seriously hampered the forward march of the post-independent Sri Lanka and open up new vistas for a united and prosperous new Lanka. 8 Ensure fair and equitable distribution of resources both natural and human among the regions and promote maximum and balanced regional development. 9 Provides a political framework where all people will begin to think firstly, as members of a Rata (Ruhunu, Pihiti or Maya), and secondly, as one nation instead of the present tendency of thinking as Sinhalese (Low country and Kandyans), Tamils or Muslims etc. 10 Restore the lost core historical, political, cultural and economic heritage of the people of this Island nation and lay the foundation for future political stability and socio-economic prosperity. 11 Put an end to the curse of provinces that were designed by the British to divide and dis-integrate this country on ethnic grounds and the Provinces and Provincial Councils forced on us by Britain and India to achieve their sinister objective of creating a Tamilnadu within this country. 13 This system will do away with political rivalries and wastage of time, money and election related crimes and bring about a system of government of our own keeping with the age old traditions of the country where the will of the people will reign instead of the present practice of the whole nation becoming the victims of the Colombo base agents of the International and colonial masters. 15 Remove dictatorial powers and immunity of the President and empower people with decision making power down to the very grass root level and make their sovereignty meaningful. 16 Will result in the devolution of power to the grass root level and people will share the power of governance making it fully democratic. 18 Party politics will disappear from Trade Unions, Universities and government offices thereby millions of man hours lost per day on demonstration etc could be gainfully used for nation building. 19 Finally it will mark the formation of a government by the people, for the people and of the people. Every citizen under this system will feel proud that he is also a part of the Government. 20 It will mark the dawn of a new era in democracy in practice and might become a model for all countries that have become victims of colonial exploitation discarding the western systems of government utterly inappropriate to their native environments. 22 This system of government is expected to guarantee governance in accordance with Dasarajadharma and enthrone the principle of ‘Bahujana sukhaya Bahujana hitaya” preached by the Buddha. 24 It will mark the dawn of an era of new political culture leading the way to a ”civilization’ State as Martin Jaque has described in his book ‘When China Rules the world’’. 27 No politician will be able to run away from responsibility firstly as they have become local people who have a moral obligation to the people and secondly as they could be recalled by the people at any time. 28 All institutions will have politicians who are compelled to do what the people want and none will be able to deceive and rob the people and do what they want. 30 There want be any claim for devolution as maximum power will be decentralized up to the village level under this system for people to take their decisions within the framework of broad National Policies. Thereafter we invite party leaders for a joint meeting and present our document. The group that acceps our proposals and gives a definite written undertaking to implement our programme to the letter after they win the election, we will organize the whole country to support them. Just like what the Sinhala Buddhist patriotic people did in 1956, but with a difference, that is they cannot go back on their promises like how they have been doing ever since 1948, with impunity. Besides acceding to our above requests they also have to agree to accommodate 28 candidates recommended by us to represent the 28 Districts and agree to reserve a minimum of five important ministry positions and five Deputy Ministry positions to our movement. Overall these are only some random thoughts that came to my mind. Details have to be worked out jointly by a panel of patriotic experts in each field like eminent persons well versed in Local Government, Constitutional Law, systems of government including our own traditional Sinhala system that was there from ancient times. Sudath – Mema lipiya ithaa vadagath. Karunaakara meya Sinhalata parivarthanaya karala palakaranne – prasidde karanne. This entry was posted on Friday, August 3rd, 2018. You can follow any responses to this entry through the RSS 2.0 feed. You can skip to the end and leave a response.